Here I go...tackling an incredibly divisive topic. Honestly, I had no idea this was a divisive topic until recently, when articles starting popping up with titles like "Why I Don't Write Thank You Notes", "Why I Still Write Thank You Notes", and even "Please Don't Write Me a Thank You Note". People have opinions on this topic. Strong ones. And they will defend them vehemently. You have people who assert that they will never again purchase a gift or do anything for someone who didn't write them a card, and you have people who insist that it is environmentally irresponsible to do any such thing and they are annoyed that these card fill their mailbox at all. Man, people get passionate about the little things. Were people always this firmly ensconced in their camps, or is this a social media don't you dare judge me because I judge you first development? Anyway, I'm not here to debate the topic. Go off into your corners and strategize and I'll sit here like Switzerland with good chocolate, closing my ears to conflict. Personally, this isn't something that I have incredibly strong feelings on. When I give a gift it's nice to get a thank you note, but if I don't get one, I'll assume that you got busy. In this house, however, we send thank you notes. Well, we try, and most of the time we're successful. That was drilled into me from childhood. If you got something, you sent a note. A specific note no less, acknowledging exactly what you received and why you're thankful for it. I remember growing up and having to have my Christmas notes done before returning to school in January. I've carried that with me as I've grown up. I send thank you notes. That goes, whether or not we were together when the gift was opened an in-person thank you was said. Doesn't matter. We do notes. Sidenote: there have been a few times when I've dropped the ball. Sometimes life happens. Like I said, I'm not fighting to the death on this. In fact, I haven't managed to mail our Christmas thank you notes yet. So please, no comments that say "NO! Remember Madison's third birthday? I did NOT get a note". I'm sure you're right. But no fighting in Switzerland. Up until this year, I've handled the note writing for anything involving the entire family, the girls, and me. I tell Adam to handle his own birthday, but I do everything else. When it comes to the girls, I've learned to make it easy on myself. I order picture cards from Shutterfly (or somewhere comparable) and have the girls dictate a sentence to me to write on the back about why they like whatever it was. This way, the giver gets a recent picture of the girls and a note, and I only have to write one sentence per card. Feels like win/win to me. This year, however, Madison is ready to take on her own notes. For me, this means that I have gone from spending about an hour total ordering, to approximately 491 hours as she realizes that she forgot a word or spelled one wrong and needs another card, because of course this is a situation for fancy pens, or standing over her, feeding her the spelling one letter at a time. We made it through one note, which took approximately an hour of our lives and would be difficult to read for anyone who isn't a current kindergarten teacher, before I decided there had to be a better way. I didn't want to let her off the hook. After all, I had just schooled her, as my mom schooled me, in the etiquette and she's been happily on board. So to throw in the towel didn't seem right. 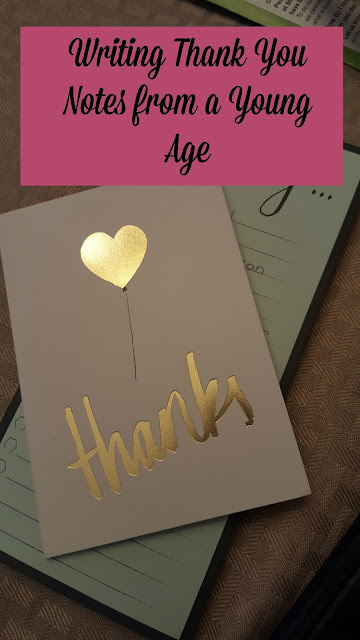 But grown up thank you notes like I send weren't there yet. What did seem to fit the bill were these fill in thank you notes. The bulk of the writing is done, but Madison can still add her own personal touch and take some ownership. You'll never change a life long thank you note writer. When someone tells me not to send one, I get very uncomfortable. I may drop the ball, but then I'll own the guilt. When I'm told not to...can't handle that. We don't need to make this a war. I'll never judge you for not sending one, if you'll let me hang onto my old school etiquette and pass that onto my girls. In a world of text messages, we'll be the surprise in your mailbox.